In 1994, after my husband Brigadier General Tom Carroll was killed in an Army plane crash along with seven other soldiers, the Tragedy Assistance Program for Survivors (TAPS) was founded to provide compassionate care for the families of America’s fallen military heroes. Almost 25 years later, TAPS is proud to help more than 80,000 surviving military loved ones find hope, healing, resources and access to education assistance and casework ​support. We could not do what we do for these families without the help of our charitable partners. We are so humbled that Yuengling chose TAPS as their partner for the Lagers for Heroes Program. The Lagers for Heroes Program stands strong with the dedicated service men and women who have made tremendous sacrifices for our country. TAPS has felt the warmth and sincerity of Yuengling’s commitment to care for our service members and their families. They have opened their doors and their hearts, and we are so grateful to be part of their extended family. 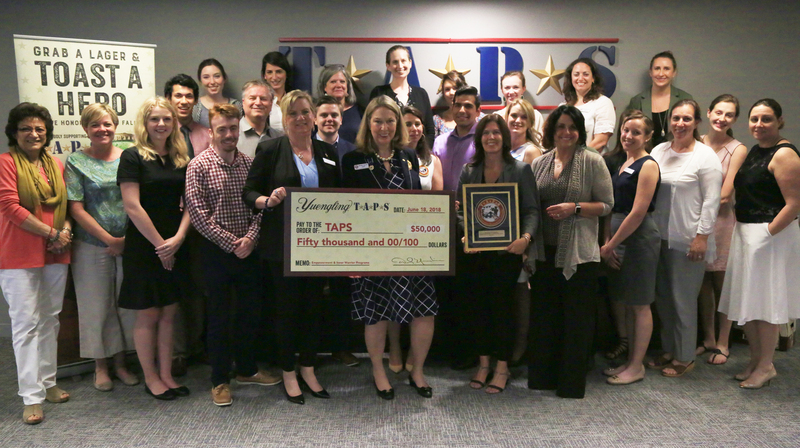 TAPS recently hosted Debbie ​Yuengling who presented us with a $50,000 check at our Headquarters in Arlington, Virginia. In addition to the check, Yuengling has also donated $3,277 as a result of their Heroes Collection merchandise sales. And, just this week, Yuengling raised $1,000 at the Atlanta Peachtree Road Race. These generous contributions will support the TAPS Inner Warrior Program, a unique strength-based therapeutic program focused on building health and wellness for grieving family members coping with the loss of a loved one. We believe that knowledge, practical tools and self-care are the foundation for handling grief and loss. Through the TAPS Inner Warrior Program, we aim to build resilience, resolve and courage for daily life through challenging adventures.